Final Fantasy Mystic Quest's is an RPG unrelated to any other Final Fantasy game. Its presentation and battle system is broadly similar to that of the main series, but differs in its inclusion of action-adventure game elements. The gameplay takes a departure from the main series in a variety of ways. Many series staples are eliminated, such as random battles, save points, manual equipment, and the party system. 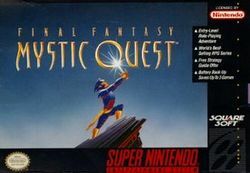 A year after its U.S. debut, the game was released in Japan as Final Fantasy USA: Mystic Quest. In PAL territories (Europe, Australia, and New Zealand) the game was released as Mystic Quest Legend - it was meant as a sequel of sorts to the previously released Mystic Quest (Seiken Densetsu) for the Game Boy. In the game, the player controls a youth named Benjamin (name given in the US manual) in his quest to save the world. His goal is to reclaim a set of stolen crystals that determine the state of the world's four elemental powers. This page was last edited on 11 February 2016, at 01:06.